What I did not know at the time was that all that restoring photos for the purpose of the tree with result in me actually learning Photoshop and eventually ending up as photo retoucher but this is a story for some other time. After I met my husband Michael, while working on the cruise ship in the Caribbean, and then moving to UK, life got very busy. I stopped thinking about our family tree until our older one had to make one for her homework. I have opened Ancestry account to use their family tree making software but I got stuck on my husband’s side of the tree. So when Ancestry asked me to review their AncestryDNA tests I could not be more than happy as deep inside I always wanted to take them anyway. I love the idea of having our family roots in different parts of the world. I think that now it is very important to embrace diversity and talk about it to stand up against racism and xenophobia. On Michael’s side things will get probably more exciting as there is very little information. We can only guess ancestors on his dad’s side came from West Africa before being brought in slave trade to Montserrat in the Caribbean. On his mom side there will be Carib Indians from Dominica and possibly some Chinese influence, after his great grandmother from Martinique, if I remember correctly. When we combine all this together our girls will probably have roots across all of the continents, except for Australia. At first I did not realize how the DNA works and I completely missed the fact that although our girls have the same mom and dad, their DNA is unique and for this reason they may have inherited different genes. For instance they could inherit different ethnicities or not inherit some at all, especially if they were already traces in our DNAs. That would explain why they look so different. Therefore in future we would definitely like to test both of them as well, if they will be curious to know more. AncestryDNA provides a personal ethnicity estimate from up to thousands of years ago from 26 separate regions across the globe (including Great Britain, Ireland, Scandinavia, Middle East, Asia Central, East and South and nine African regions). It allows also to uncover new family connections as the test matches users with a database of more than 3 million people worldwide who have taken the test. With the Mother’s Day approaching Ancestry offers Mother’s Day gift discount at the price of £69 instead of £79 + P&P for the AncestryDNA kit so you can give your mum the exciting opportunity to discover more about herself and the unique stories hidden in her genes. Taking test itself is pretty straight forward. Once you will order the kit you have to activate your test online (using the unique number from the kit), spit in the tube, pack it in provided bag and prepaid shipping box and drop it off in the post box. It may take up to 6 – 8 weeks for the results to show up in your Ancestry account but you can check progress of your test at any time. You can also start working on your family tree while you are waiting or even search the records (if you have paid Ancestry subscription). Our results are back and can be seen here. 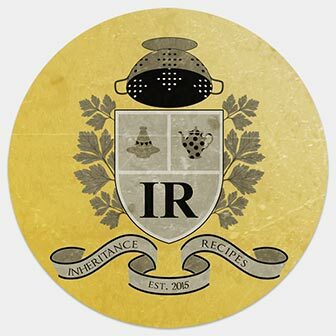 I’m also excited that the outcome of the tests may result in some new recipe inspirations for our Inheritance Recipes. In a meantime you may want to try out some of our recipes that were inspired by our ancestral culture: Traditional Tatar Meat Pies – Vak Belyashi, Polish Style Chocolate Crumble & Walnut Cheesecake, Euro-Caribbean Chicken & Dumpling Soup – Fusion Cuisine, Chicken Pelau – Caribbean Comfort Food, Gin & Coconut Water Drink – Caribbean Classic, Barszcz Czerwony – Polish Red Borscht Soup Made Easy or Tuna Bakes – Fried Dumplings from Dominica. DISCLOSURE: We have received complementary AncestryDNA test kits for review purposes. We were not financially compensated for this post. All opinions expressed here are our own and we retained full editorial control. How fascinating, Margot. You’ve got me all curious now about how your results will turn out. Tempting to get mine done! Thank you Michelle. I don’t really want to get too excited yet, in case my results won’t reveal any big family secret but I’m still waiting very impatiently… Michael’s results may be very interesting. This is so interesting! I’m really curious about my heritage and looking forward to reading about your results. Thank you Jemma, if you are curious about your roots, you should definitely take the test! I’m very curious myself…. and I try keep myself occupied by gathering info for the tree. Apparently having names and dates in the tree and connecting them to DNA samples may improve results, especially if someone else from the relatives got tested as well. I know what you mean Helen :) Finding long-lost relatives would be nice but what I’m hoping for is to discover where our families came from. For instance on my husband’s side we do not know where some of his ancestors came from. They were brought as slaves from Africa for certain but that’s it… DNA test may answer some of our questions. This is fascinating! I would absolutely love to do one of these tests. I always assumed it would involve blood tests or something, but spitting in a tube sounds easy enough!